Oscar came to GRROWLS all the way from Memphis, TN. 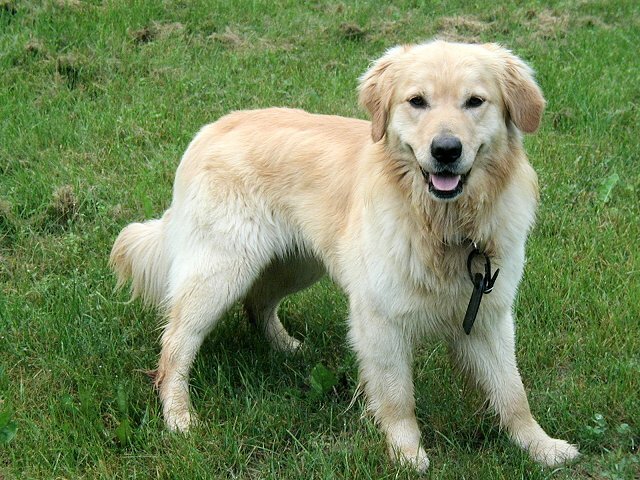 While his original family loved him very much, they knew they were not giving him the time and attention he deserved, so they contacted MAGRR, the local golden retriever rescue organization in Memphis, to help find him a family who would be able to spoil him rotten. Unfortunately, MAGRR was overflowing with goldens needing to come into rescue and contacted GRROWLS about taking a couple into our program. With the help of many wonderful volunteers, Oscar and Spencer, another golden boy from Memphis who was in the same situation with his original family as was Oscar, were transported from Memphis, TN to their foster homes with GRROWLS in New York State. Oscar was adopted by a wonderful family in the Albany, NY area who had recently lost their 14 year old golden in April 2003. Their house was so very lonely, so they contacted GRROWLS about adopting a rescued golden. As soon as they met Oscar in his foster home, they knew it was a match made in heaven. Oscar’s new mom recently said to a GRROWLS volunteer “we needed this dog far more than he needed us.. Thank you.” They plan to do obedience with Oscar and get his CGC and TDI certificate so he can visit hospitals and nursing homes.